Take a bottle of water and let everyone watch as you pour it into a Styrofoam cup. Ask who believes you can turn the cup upside down without a drop of water coming out. Call up a volunteer and ask if she really believes. Then ask if you can hold the cup over her head while you turn it upside down. This is a great illustration to demonstrate the difference between believing with your head and trusting with your heart. It’s also a great tool to explain that you don’t need all the answers in order to keep trusting. Bad things might happen and you don’t know why but you can still trust God. 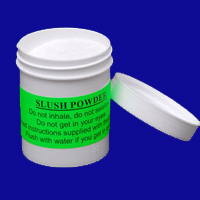 There are also many other spiritual lessons that can be taught using this special powder.